I don't feel like this video really needs an introduction. If you want a good laugh just watch! 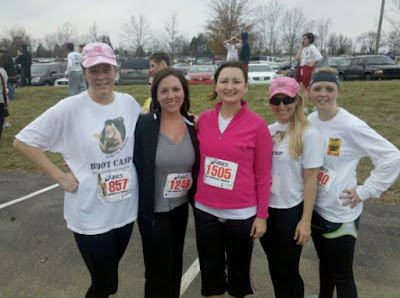 Below is a picture of my boot camp ladies...I still think we should have all dressed up like cougars! Anytime my family gets together we play games. This past Christmas was no exception. 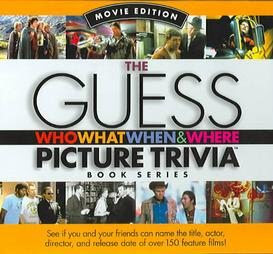 One of the games we played is called "The Guess Who What When & Where Picture Trivia- Movie Edition". The game is simple to play. When it is your team's turn you are shown a still picture clip from one of the 150 feature films in the book. From that picture you have to identify: the film title, the actors that are pictured, the director & the release date. After you have answered those questions there are 3 bonus questions about the movie. The movies range in date from the 1930's to present time. For people who are so media drawn, this was a great test of knowledge. Mike and I were surprised by the amount of classic & popular films that we hadn't seen. In fact were were so surprised, that I brought the game back home with us and have made a rather long list of movies to check out from the library. So far we have only gotten through 3 movies on the list: The Graduate, Rosemary's Baby, & Quiz Show and we have Kramer vs. Kramer upstairs waiting to be watched. I'm sure we won't end up liking all the movies on the list, but so far we haven't been disappointed. Being that it is almost the end of January (where does time go?) I figure I should blog about our family's New Year Resolutions or shall I say, lack there of:) I personally have never been a big fan of the whole New Year Resolution concept, only for the one reason that I make them and never fulfill them. So come mid-year I look at the piece of paper on which I have written my resolutions and feel like a complete failure. So to save myself from my own judgement, I just don't do it! However, I do believe in fresh starts and I do believe that January 1st is a great time for re-evaluating and taking stock of all that has happened the prior year. It is a great time to really think about what is important and what can be put on the back burner. Even though I don't do the whole formal resolution thing I am pretty sure every January I make a mental list and prioritize the goals that I have for my family and myself. I will share one of the goals that I have made for myself for 2010 and it is actually one that I have to stick to or I will be out a good chunk of cash. I will be running in my very first 1/2 Marathon on April 24th. I think back to who I was physically a year ago and I am amazed at how far I have come. Also, for those of you who are wondering about my current boot camp status, I am still an addicted boot camper! January marks my 10th straight month of camp. I know I promised before and after pictures and they are still coming, but since I am so close to my one year boot camp anniversary I have decided to do the big reveal on that date in April. This year Mike and I hosted the Organ Family Christmas. On New Years Day, after Mike and I completed the Resolution Run, the whole family met for lunch and then headed to our house for the Christmas festivities! Once we got to the house, it wasn't long before we were all opening gifts. This is one tradition that I absolutely love! Whether it is a homemade gift or something bought at a store, something needed or just a guilty pleasure, I love being able to give family members something they will enjoy. After all the loot was unwrapped, the games began. We spent the afternoon playing cards and dominos, watching football, visiting and eating. It is so great to be able to spend quality time with people we don't get to see very often. Thanks Organ Family for another great Christmas! For the Organ family, 2010 started off with a 5k race. 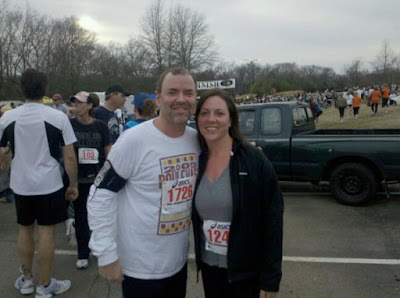 This year Mike and I decided to run in the Resolution Run which benefits United Cerebral Palsy of Middle Tennessee. Other than the temperature (27 degrees), the race was great! The course started on Demonbreun Street, down 1st Avenue, took you across the Woodland Street Bridge, around LP Field (Titans Football Stadium), across the Pedestrian Bridge and ended back on Demonbreun St.
At the race, I met up with my boot camp girls. Mike's parents were in town for the Organ Family Christmas. They braved the cold weather and came to the race to cheer us on. Hope everyone has a very happy and healthy new year! Once Shane and Sara arrived the group was complete and we could take the traditional group picture. Then it was time for the silliness to begin! This year's Johnson Family Christmas was one of the best ever! There are so many pictures in this post I will let them tell the story. Christmas morning BJ treated to the whole family to homemade waffles...Yum! The next 3 pictures I love because they are pictures of homemade gifts. The first 2 pictures are of the Santas my mom painted for the boys. Mike got a Golfer Santa & Kyle got a Fishing Santa. They are amazing! The 3rd picture is Mike opening a golf rack my Dad made him to display the 3 antique golf clubs we bought in London. I can't wait to hang it in Mike's office. Once we get in hung I will post a picture. This past Monday Mike celebrated his 39th birthday. After he got home from work he opened his gifts and then we headed to eat. For dinner, Mike wanted to try one of the restaurants on our list of 31 locally owned restaurants. He chose to eat at Cafe Nonna which is a little Italian restaurant located in the Sylvan Park neighborhood. The salad and pasta was excellent! We weren't too impressed with the bread, but it's free, what can you say!?! Also, when I called it a "little Italian restaurant", I wasn't kidding. There are only about 10 tables so I would recommend making reservations. We will definitely we going back to Cafe Nonna.